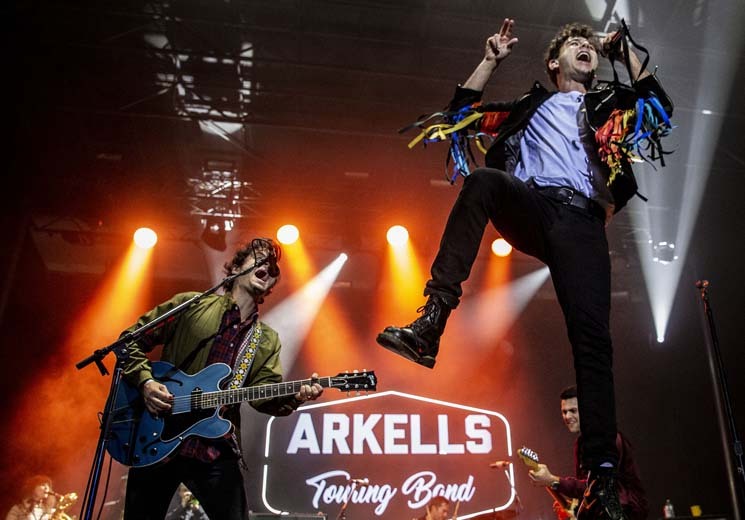 The Arkells are built for big stages: national awards shows, arenas, festivals. Their straightforward anthem-rock-through-a-Canadian-filter sound is easy to tap into, and their unbridled energy and honed crowd command made for a memorable headlining show at Sonic Field Day in Edmonton. Never have rainbow-coloured tassels worked as hard as the ones on frontperson Max Kerman's jacket, as he stomped up on risers and out into the barricades, demanding that everyone in attendance join in on the performance. Join in they did. Early in the set, Kerman asked if anyone in the audience knew how to play guitar, and one crowd-sourced volunteer reached the stage, strapped on Kerman's Telecaster and nearly turned inside out playing rhythm guitar, sing and mugging epically, as if he just arrived back from the future with a photo of himself fading away in his pocket. Along with the electrifying performance from the rest of the band, there were more than a few tricks up Kerman's rainbow-tasselled sleeves to gratify the crowd and ensure that the energy, at all times, remained maxed-out. From designing a digital constellation in the crowd by asking everyone to raise their phones in unison, to name-dropping local bars and venues, the show they've constructed is a monument to headlining large scale rock concerts.